Those arriving for the first time in Kyoto usually arrive at Kyoto station, and probably are a little surprised, as they think to go to the "ancient capital of Japan," and finds themselves in one of the most modern and futuristic places on earth. Today's Kyoto Station was completed in 1997 by the architect Hiroshi Hara, and includes a number of department stores attached to it or nearby, especially in the area of the north exit (Karasuma gate), the most lively one. 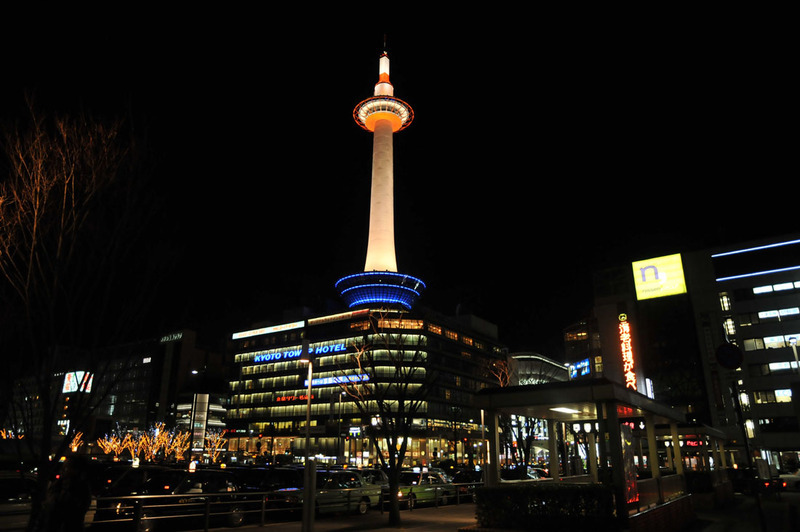 A modern tower, built in 1964, and 131 meters high, it is the tallest building in Kyoto. At about 100 meters high, there is a 360-degree observation deck from which to view the city from above. The view is nothing spectacular though, because the city is consists mainly of low buildings. At the base the tower there is a 9-storey building, in whose basement there is a public bathroom (onsen), while the building is occupied by a shopping center in the lower part, and by a mid-range hotel in the upper part (the Kyoto Tower Hotel). 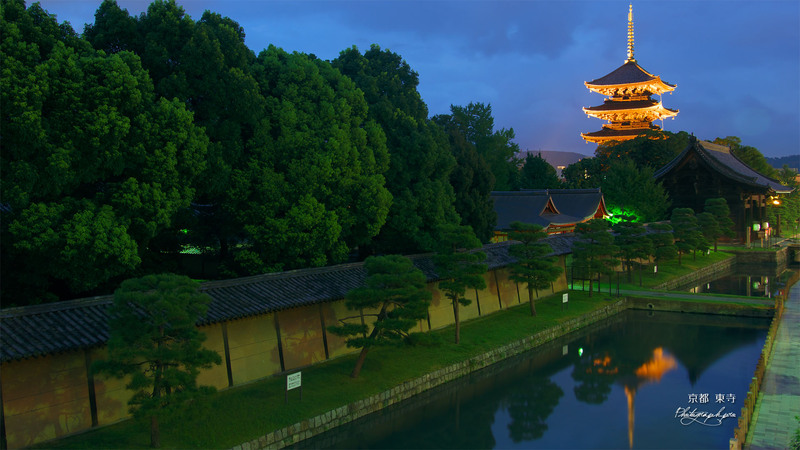 One of the many places in Kyoto that are part of the UNESCO World Heritage Sites. This temple was founded in 1591 and is, together with the nearby Higashi Honganji, the headquarters of the Jodo-Shin sect of Buddhism. This temple, headquarters of the Jodo-Shin sect of Buddhism along with the nearby Nishi Honganji, was founded in 1602. 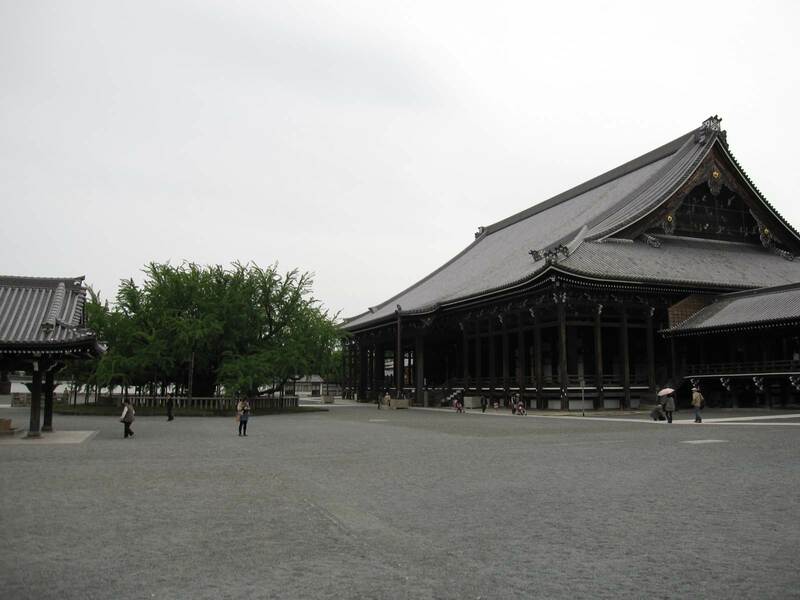 The main building of the temple is the largest wooden building in the city and is dedicated to the founder of the sect, Shinran. The nearby Shoseien gardens also belong to this temple (see below). This traditional Japanese garden is located about 10 minutes from Kyoto station, two blocks east of Higashi Honganji Temple, to which it formally belongs. Inside, there are many traditional buildings, including some tea-houses. 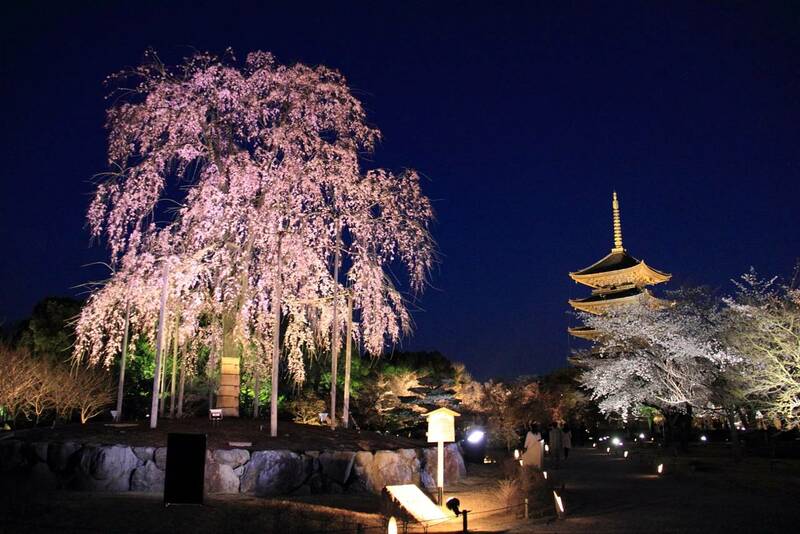 One can admire the flowering plum and cherry trees in spring (March/April), the azaleas in May, irises and water lilies in summer, and fall of maple leaves in autumn. The southern area of the station (Hachijo Gate) is not very interesting, the only thing to point out is an important Buddhist temple, the Toji Temple 2 km far to the south-west. 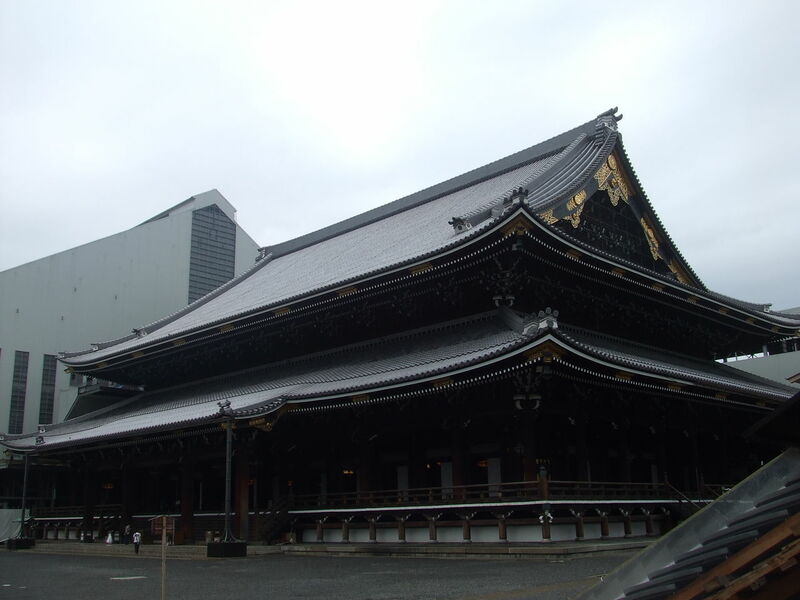 This temple is located about 2 km south of Kyoto station, and a few meters from Toji station (Kintetsu Kyoto line). Part of the UNESCO World Heritage Sites, this temple was founded in 796, and once formed together with the nearby Saji Temple (which no longer exists) the gateway to the city of Kyoto (Japan's former capital). Inside there is the highest pagoda in Japan (58.8 m) whose lower floor can be occasionally visited. The temple buildings are surrounded by gardens and open spaces, where some street markets are hold: the 21st of each month you can find a flea market (Kōbō-san), the first Sunday of every month there is rather a small antiques market. Staying near Kyoto station is highly recommended, both because it is a commercially vibrant area, where you can find everything you need, and because it is in a central position compared to the rest of the city, and from Kyoto station you can easily reach any other part of the city and outside the city. Among the most convenient business hoteles, I recommend two hotels belonging to the APA Hotels chain in the area north of the station, the APA Villa Hotel Kyoto-Ekimae hotel and the APA Kyotoeki-Horikawadori hotel, and the Keihan hotel in the southern area. 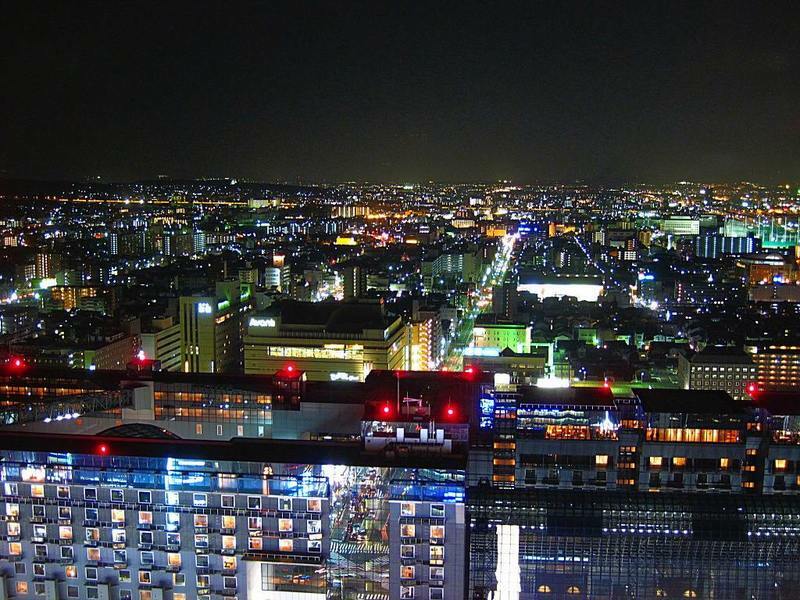 A luxury hotel among the cheapest ones (but you need at least 20,000 YEN per night) is instead the Hotel Granvia Kyoto, located just above the building of Kyoto station. The main station in this area is also the main station of the entire city of Kyoto, that is Kyoto station. Your first day in Kyoto you'll probably arrive at this station, because it is the station served by the shinkansen (Tokaido shinkansen), by trains from Osaka Kansai airport, and buses of different companies from all over Japan. The main bus station is located in front of the north exit of the station, while the night buses of Willer Express arrive and depart from a place near the south exit (look at the company's website for more precision). Among the many local lines that serve this station, I remember the Karasuma Line of the Kyoto Municipal Subway (metro), the JR Nara line and Kintetsu Kyoto Line (useful to take a trip to Nara), the JR Kyoto Line (from/to Osaka).